Politicana | UK & US Politics: No knock out blow for Obama – can McCain bounce back? 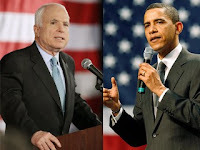 No knock out blow for Obama – can McCain bounce back? The second televised Presidential debate between John McCain and Barack Obama in Nashville did not provide the killer blow that both candidates were looking for. For all the post debate talk, Obama did not land that knock out blow on his rival. He may have edged this encounter, and has increased his lead in the process. However, as many will testify, there is still plenty of time between now and 4th November for John McCain to rally. The latest polls show that Obama is leading his opponent on every issue and in every poll. The Gallup poll placed him a firm nine points ahead of McCain. This is the first time that he has built up a substantial lead. Yet, the Illinois Senator may regret the fact that he was unable, for all his brilliance, to repel John McCain once and for all. John McCain will no doubt come back stronger in the next few weeks. He is helped, and hindered, by the Palin factor. She should be able to rally more support from the Christian right and the so-called ‘frontier’ folk that she is solely appealing to. Obama will lose some support in the key swing States of Ohio, Michigan and Pennsylvania. These are the facts of elections. Obama is in a commanding position at the moment. But this fight is not over until the final bell. There is one more round for this old slugger to get back into the fight. If I was a betting man, I would not bet against his resurgence.